PayRange, a mobile solutions provider for vending and other self-service machines, has teamed with Masterpass, a digital wallet app from Mastercard, to allow U.S. PayRange users to receive up to $15 worth of free credit. Consumers can install the PayRange app to make purchases from vending machines. The customer can swipe their smartphone’s screen to complete the purchase. PayRange and Mastercard began partnering on Masterpass in 2017. 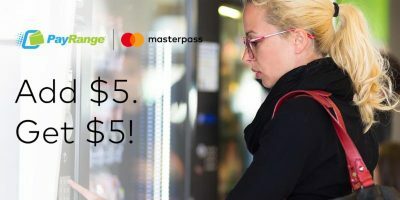 Beginning on March 1, 2018, the companies will offer “fund $5 with Masterpass and get $5.” For a limited time, U.S. customers who use Masterpass to fund their PayRange account with $5 or more will automatically receive a $5 bonus credit. Customers can take advantage of the special offer three times, totaling $15 of free credit to spend at vending machines. The program will be for a limited time period.